The Blog is venturing into new territory and publishing its first book review. Readers are invited (and encouraged) to send in readable and succinct reviews of books they have recently enjoyed, in order to enhance everyone’s summer reading. Richard Gaunt writes. . .This is a review of a life changing book. I didn’t choose to read it. It is almost as if it sought me out and thrust itself into my hand. To start with, I didn’t like it.. But then I was hooked. I was planning to depart on holiday when an email from Amazon popped up. Why not have a free trial of Kindle Unlimited? Why not indeed? You choose a number of books for a 7-day free trial, after which they disappear. Perfect for a week away, so I signed up. The others were rubbish. But the last one, downloaded at random, and with only 2 days to go before automatic deletion was “Ancient Knowledge”. 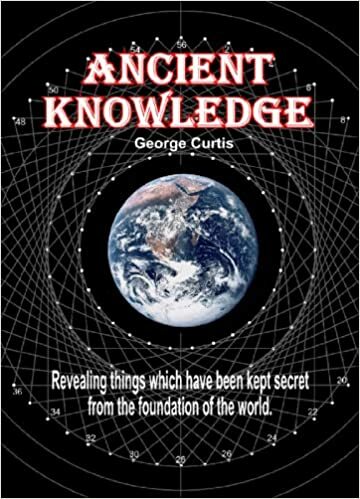 By an author I’ve never heard of, one George Curtis. Self published by the look of it. I gave it a try. And then began a very interesting couple of days. I learnt the secret of Life, the Universe and Everything, and a lot more besides. (AUi)(9/4pi).ln30 – F = (AUo)(3/2pi). But how the very clever, precise and logical Mr Curtis reaches this conclusion, and what it actually means, is a fascinating and literally earth-shattering (and also amusing and irreverent) treasure hunt which will have you on the hook from the moment you realise where he is going. I am not going to deprive you of the fun, or Mr Curtis of a very well-deserved royalty, by spilling the beans, other than to say it starts with the Flood, and the Tower of Babel, delivers a startling piece of game-changing logic backed up by detailed proofs which hit you like a thunderbolt, and ends in the present day with a challenge to us all. It is a not a religious or mystical book in any sense, although it quotes extensively from both the Old and New Testaments of the Bible, and it certainly reminds us of who wrote that book, and why. Mr Curtis is an atheist, but Christians will not be offended. He affords the Christ the utmost respect, along with some, but not all, of his followers. Druids, New Agers, Scientologists, Mormons, Quakers and Jehova’s Witnesses will probably feel a bit foolish. The curious thing about the book is that it does not appear to have been reviewed anywhere else, which is a pity. It looks as if the universities don’t want to know. And Mr Curtis is virtually unknown We wonder if it might be a pseudonym for someone anxious to guard his reputation in other fields? A brilliant read, and something to discuss over endless pints in the Drinkers’ Arms. You can get it on Amazon as a e-book, or obtain a hard copy on line.